If your client complains of pain shooting down the back of her leg accompanied by tingling, or numbness, she may be experiencing symptoms of sciatica. Sciatica involves a compression or irritation of the sciatic nerve. The pain can occur for a variety of reasons, including a herniated disc pressing on the nerve roots coming out of the spinal cord into the lumbar region, or a tight piriformis muscle pressing into the sciatic nerve that feeds down into the leg. Although the symptoms may go away over time, there are exercises and stretches available to help alleviate discomfort. Pilates exercises that strengthen the core and stabilize the pelvis in neutral placement can decrease the downward pressure on the intervertebral discs. Think about the intervertebral discs like fluffy marshmallows. You can squish them and watch the sides protrude or you can pull your fingers apart to return them to their original shape. Being able to sit tall with muscular support for the low back in a neutral pelvis position gives you better odds at decompressing the irritated nerves if the discs bulge. Positions requiring spinal flexion can sometimes increase symptoms. 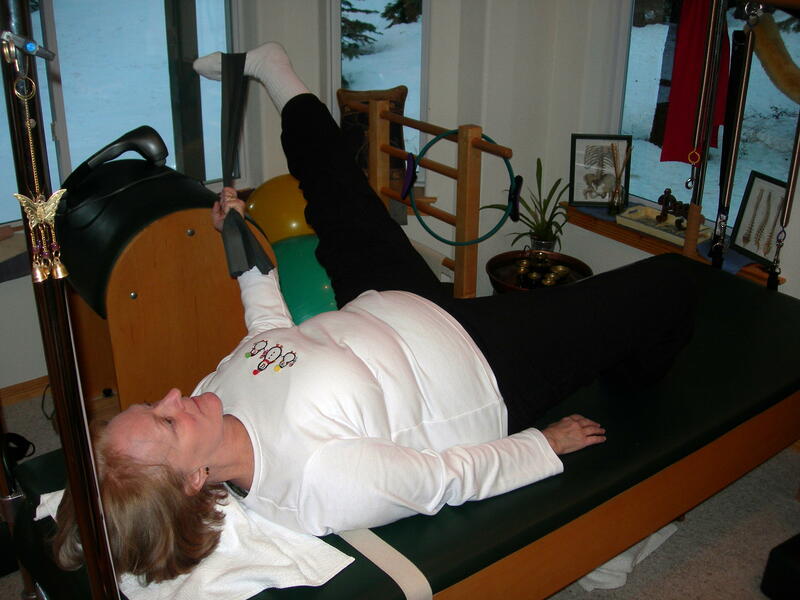 Emphasize core strength in neutral pelvis placement found in sitting, standing, side lying, quadruped, or neutral pelvis supine positions such as footwork on the Reformer. Prolonged standing or sitting can also increase symptoms, so try not to stay in one position too long. 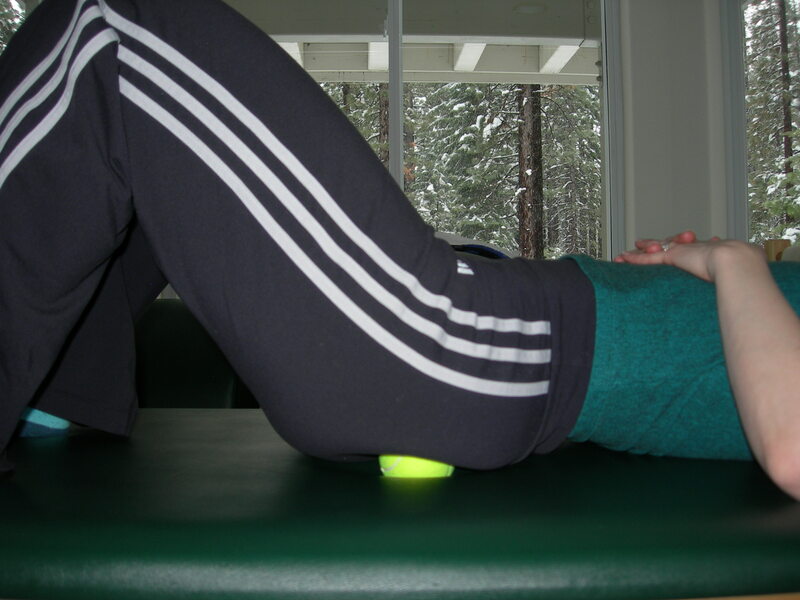 Be sure that your client understands how to activate the pelvic floor, transversus abdominis and lumbar multifidi. Most people have never consciously tried to contract these muscles, and need to first find them in order to activate them for pelvic stabilization. If your client is not used to sitting up tall, activating postural muscles can cause fatigue. When her back gets tired, make sure she reaches over to grab her ankles and takes a few deep breaths to relieve any tension created in the back to prevent muscle spasms. (See post The Use of Imagery to Help Your Client Find Lift Through the Core.) Sitting in a chair with good back support can also help. If sciatica symptoms are present when getting out of the car, you can suggest trying a towel “tootsie roll.” Fold a small bath towel in half lengthwise and roll it up as you would a yoga mat into a tootsie roll shape. Place the towel support at the crease of the car seat to prevent the pelvis from shifting out of neutral into a posterior tilt. This roll can also be placed on a chair for additional support. Be sure that your client understands that the towel tootsie roll is used ONLY at the base of the sacrum (where the crease of the seat and backrest meet) and NOT to be placed at the lumbar spine. The towel’s purpose is to give the pelvis a feeling of rocket boosters at the base of the pelvis shifting the weight slightly forward on the ischial tuberosities, not to force more curve in the low back. Tightness in the piriformis muscle can also cause sciatic pain since the pathway from the origin and insertion of the muscle crosses over the sciatic nerve. Improving flexibility through regular stretching may also help relieve sciatic symptoms. The pretzel stretch is useful for stretching the piriformis and can be performed with modifications. Lie on your back with bent knees with both feet on the floor. Place your right ankle over the left knee and clasp the back of the left thigh with both hands and pull the left thigh toward the chest. Keeping the left thigh toward the chest, inhale and push the left thigh away from the chest while simultaneously pulling the clasped hands behind the thigh toward you. The leg doesn’t go anywhere, but muscle tension is created. Exhale releasing this muscle tension and pull the left leg closer to the chest. As you do the above, it is very important to keep the sitbones (ischial tuberosities) reaching toward the floor and try to maintain the lumbar curve found in neutral pelvis. This “sitting” toward the floor feeling creates opposition in the stretch providing a better pull. You can also rock the stretch slightly from side to side. Hold the stretch for around one minute and then repeat it to the opposite side. 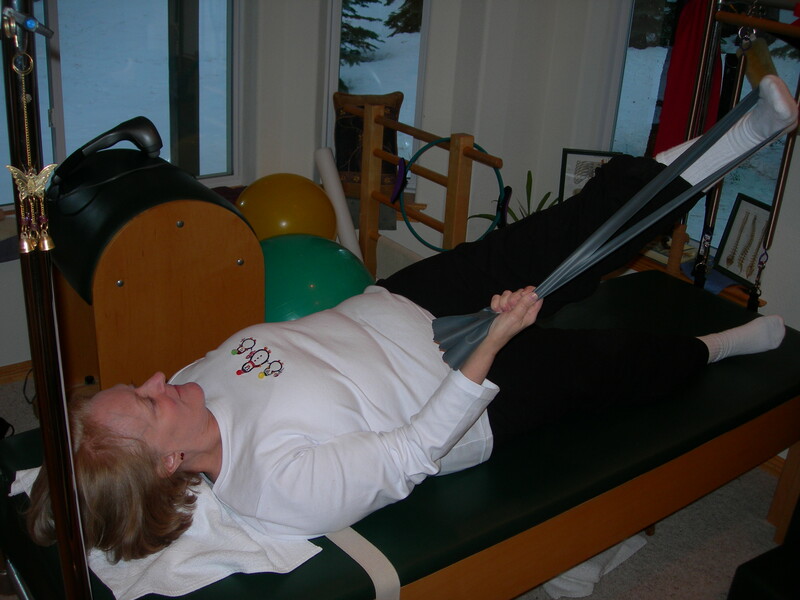 Sitting in a chair can modify this exercise for those unable to stretch on the floor with the emphasis placed on sending the tailbone back and lifting the chest up and forward. Although some clients will need to see a doctor for their sciatic symptoms, the improved core strength and flexibility provided by Pilates exercises may decrease sciatic discomfort. As we are not stationary beings, understanding how to stabilize the core as we move through space pursuing our daily activities can help prevent aggravation. With the proper knowledge and consistently applied tools, your client can self-correct if she slips into old habits. Although exercise alone may not alleviate sciatic symptoms, the pain experienced by sciatica is often a great motivator for even the most committed couch potato to give it a try.